Student teacher supervision has been an important part of teacher preparation almost since the inception of teacher education programs. The goal of this type of supervision is to strengthen the skills of the pre-service teacher. Providing this type of observation can be difficult for teacher preparation programs and university faculty. Many factors, including large numbers of students in teacher education programs and student placements in remote schools, contribute to this. In order to make the most effective use of faculty and pre-service teacher time, other options for providing this support need to be explored. The rapidly developing field of mobile technology (e.g., iPads, iPhones, Smart Phones) can be used to facilitate student teaching observations. 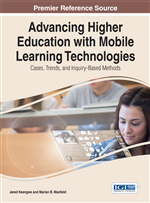 This chapter discusses how teacher preparation programs can implement candidate field supervision using video conferencing via mobile technology to increase the ability to conduct observations in schools and in a more efficient manner. It also explores the security of video conferencing applications and the issues related to using video conferencing in special education classrooms, where student confidentiality is heightened. The No Child Left Behind (NCLB) Act and current reauthorization of the Individuals with Disabilities Education Act (IDEA) require that all teachers, including special educators, be highly qualified with an appropriate credential. Nationwide, shortages of highly qualified special education teachers have been reported in 98% of all school districts, with the greatest demand reported in the poorest schools (Brownell et al., 2005). While over 95% of California’s teachers are highly qualified, nearly 10% of the State’s special education teachers are not (U.S. Department of Education, 2008). With a special education population in 2008-2009 of 678,105 students (California Department of Education [CDE], 2010), this gap represents a significant inequality for California’s students with disabilities. In order to fill this gap, over 3000 special education teachers are needed to teach students with disabilities in California (CDE, 2010). These shortages are even more pronounced in the Central Coast Region of California, where many programs are located in remote and rural settings and are thus not easily accessible. Shortages of special education personnel are nowhere more severe than in rural schools (Ludlow, Conner & Schechter, 2005). Additionally, under-prepared special education teachers (defined as those teaching on waivers, short term permits, provisional internship permits, and intern credentials) are more likely to be teaching in schools serving low income, minority, low-achieving, and English Language Learner students (Shields et al., 2003). In Monterey, Santa Cruz and San Benito Counties, the percentage of under-credentialed special education teachers of students with low incidence disabilities in 2008-2009 was 17.9%, 18.8%, and 33.3%, respectively (CDE, 2009). Traditional teacher preparation programs cannot meet this critical need. In California, enrolment in special education teacher preparation programs during 2007-08 was 11,040 students, yet only 3,592 special education credentials were issued during that time (CCTC, 2009). With the development and increased accessibility of online instruction, much of the access issue with regards to candidate preparation in content and methods can now be readily addressed by preparation programs. Distance learning has been found effective in serving people across a broad geographical expanse (Jung et al., 2006) in addressing increased numbers of students (Spooner et al., 1998), and providing increased access to students with disabilities when universal design is used (Burgstahler, 2002). However, the clinical experience, or practicum, still requires direct supervision by program faculty of the candidate in field placement settings. Recent reform efforts in teacher preparation have focused on realigning program design around the clinical teaching experience, with coursework supporting supervised practical application in the field (National Council for Accreditation of Teacher Education, 2010). Similar to residency requirements in medical training programs, these reform efforts in teacher preparation place the emphasis of training on the supervised practical experiences of the teacher in training. While preparation programs can identify specific school sites for these practical training experiences for student teachers in general education, potential barriers to this model of prescribed placement exist for special education programs. Given the shortages in the field combined with the fifth year post-baccalaureate model of teacher preparation in California, many teacher candidates in special education pursue their credential while employed in some capacity (e.g., Paraprofessionals, Behavior Technicians, etc.) in special education settings. Thus, university programs can be limited in their abilities to place candidates in close proximity to campus. Further, research has identified placement in rural settings during the teacher preparation program as a critical feature in addressing the even greater shortage issues seen in such settings (Barley & Brigham, 2008). Yet the time and mileage costs involved in providing direct, on-site supervision of teacher candidates in remote areas can pose workload and budgetary challenges for preparation programs in special education. As a result, teacher preparation programs in special education may want to consider technological solutions for providing ongoing direct supervision of teacher candidates who complete field placement requirements in remote school settings.